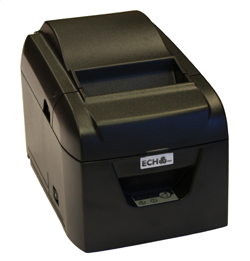 Pasadena, CA - January 16, 2012 - EchoPOS, a leading manufacturer of cost effective and eco-friendly POS equipment including cash drawers and receipt printers, unveils their new website and product, the CC-250. The EchoPOS website was recently launched and will feature affordable and eco-friendly products including a printer and cash drawer distributed exclusively by M-S Cash Drawer. These products have been designed specifically for channel partners who wish to offer affordable POS peripherals to their customers. EchoPOS is committed to providing the channel with high quality products that are environmentally friendly. We arededicated to offering value added services to resellers and software developers in North America including technical support, system integration, training and education, marketing and creative financing opportunities. The CC-250 Series is an affordable, high-speed, direct thermal receipt printer. The CC-250 offers high speed processing of receipts (250mm/second), as well as, a dual interface and ability to fit a 10cm paper roll, makes it the first choice for retailers and hospitality operators globally. EchoPOS representatives will attend the upcoming National Retail Federation (NRF) 101st Annual Convention & EXPO from January 15-18, 2012. The convention takes place at the Jacob K. Javits Convention Center in New York City. EchoPOS, headquartered in Pasadena, California, is a manufacturer of point of sale equipment that is both eco-friendly and economical. Founded in 2012, EchoPOS offers printers and cash drawers that will help your clients stay within budget and keep the environment clean. At EchoPOS, we are committed to providing the channel with high quality products that are environmentally friendly. We are dedicated to offering value added services to resellers and software developers in North America including technical support, system integration, training and education, marketing and creative financing opportunities. To learn more, visit www.echopos.com.